At Holme Poultry we are focused on providing a long term service with the highest levels of customer satisfaction – we will do everything we can to meet your expectations. With a variety of breeds to choose from, we’re sure you’ll be happy with us. Look around our website and if you have any comments or questions, please feel free to leave feedback (if you like us or contact us if you don't) We hope to see you again! Please check back later for new updates to our website. There’s much more to come! We moved onto the farm in September 2012. When we first came to view the property in August of that year. We arrived at the gate to a sea of weeds and vegetation over 3 foot tall. There was no sign of the bungalow mentioned in the broucher. But, as we walked on to the land we noticed brick work for behind a mass of conifers and roses. On venturing around the property we realised we were on the patio area, due to the uneven slabs we were stood on! It was covered in reeds, as if the pond was beneath us! Somewhere within the land we were told there was 'an acre pond!' 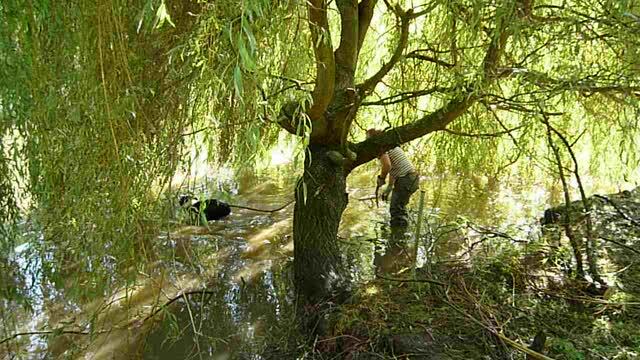 This was to be the first thing Jack (our border collie) found, to his joy, as he soon started to wade/swim out. We later found out buildings and a stable, even a static caravan! As time has gone on we have slowly brought the property back to life. Still finding sheds, paths and fences 10 months down the line. With early pictures to be viewed below. Here at Holme Poultry we love our animals and hope this shows to our visitors. We are always happy to help and give advice, we have been keeping poultry since 2004. Not all are for sale.